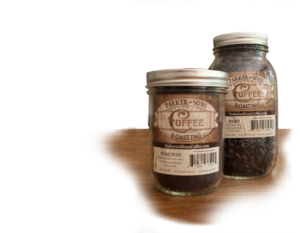 Parker and Sons Coffee Roasting started from a passion for great tasting coffee , which is still one of its fundamental principles. One way we achieve this goal is through a careful selection of our sources. We purchase coffee from responsible sources, that use organic standards. Our desire is to have flavorful coffee that is also good for you. In addition, we seek out coffee growers who promote a healthy and safe working environment. The co-ops we buy from are transparent and passionate about growing their coffee in a natural and humane way. We do all this so that you can savor your coffee knowing that it has been locally roasted and responsibly sourced. Another way we strive for excellence is through our packaging. We did not want our coffee to lose its fresh roasted flavor. So, we sought ways on how to help our customers keep that fresh roasted taste longer. We finally decided that glass Mason jars were the most suitable for the job. They are reusable, recyclable and reliable. Best of all, our jars boast the stamp of “Made in the USA.” So, even though our coffee is grown in other countries, it is locally roasted and packaged with American products. Just another reason why you can feel good about drinking Parker and Sons Coffee.